Of all the Scottish distilleries that people in the whisky industry are meant to like the one that I’ve paid least attention to in recent times is Springbank. I loved the ‘Rundlets & Kilderkins‘ bottling that appeared last year and used to ensure that I always had a bottle of Longrow 100 proof in the cupboard, but other than that I’ve not really tried anything from them in recent times. Being a reflective sort (self-examining rather than polished) I’m assuming this is because most of the contact I’ve had with the brand in the last couple of years is hearing about how expensive their older bottlings are, and seeing the Longrow 18 fly off the shelves for a scary amount of money, even though I thought it quite average. So, when I was offered the choice of various ‘Grand Tastings’, the top end tasting sessions that happen the night before the big day of the Victoria Whisky Festival, I pounced on the Sprinbank one. We had no indication of what might be on the mat, but behind the times as I am any recent bottlings would be great. However, that wasn’t entirely what happened. The evening was hosted by Ranald Watson, Springbank Sales Manager and former tasting room manager, who had come over from Scotland with an interesting bag of goodies – only one glass on the mat was filled with a whisky that had, at that moment, been released. Springbank was founded in 1828 by John Mitchell, whose descendants still own the distillery today, on the site of his father’s unlicensed still in Campbeltown, the small town atowards the bottom of the Kintyre peninsula that was once the powerhouse of Scotch whisky distilling. While it once played host to 30 distilleries in its heyday, a combination of factors from the state of the whisky market to the low quality of much of the malt produced has pared back that number to just three in 2013, Glen Scotia (owned by Loch Lomond), Glengyle (a young distillery set up by Springbank) and the Springbank distillery itself. Back when they started their first customer was a gentleman called John Walker, who sold their whisky at his Kilmarnock grocery in the days before his son created the blend that carries his name, but since then it’s been up and down. They came through the collapse of Campbeltown as a distilling area but stopped production between 1983 and 1988, as well as for short periods since. In 1998 the SWA , during their occasional rejigging of regulations, removed Campbeltown as a separate whisky region, rolling it in with the Highlands – there were only two distilleries left, with only a small output, so you can see their point. Hedley Wright, company owner and great-great-great-grandson of founder John Mitchell, noticed that there were three distilleries in the Lowlands, the now smallest remaining distilling region, and built Glengyle down the road from Springbank, on the site of the old Glengyle distillery that closed in 1925. The distillery came online on March 24th 2004, the SWA were contacted, and Campbeltown, now with the same number of distilleries as the Lowlands, was back on the region list. They produce three styles of whisky at Springbank, each released under its own name – Springbank, lightly peated, “2.5 times’ distilled; Longrow, more heavily peated, double distilled; and Hazelburn, unpeated, triple distilled. The distillery malt all of the barley they use in their whisky on-site, the last distillery (as far as I know) to do so – others do a proportion (Balvenie, Kilchoman, etc) but noone else keeps it all in-house. The regular Springbank barley is peated to about 12-15ppm, dried over peat for about 6 hours, coming down to about 4-5ppm after distillation, and the Longrow malt is up at about 45-50ppm, dried for 48 hours. They try and use as much local peat as possible, but it’s a scarce resource and if they need more than they are allowed to cut in a year then they bring in extra from Tomintoul. Other than the peat levels of the barley the main difference between the three spirits produced at the distillery that’s commonly discussed is the distillation method itself. Longrow is distilled the regular two times; Hazelburn runs through three stills; and Springbank does something slightly different, using a process ‘2.5 times’ distillation that generally confuses everyone, no matter how many diagrams are drawn. Ranald’s been explaining it for a while and when written down it seems fairly simple: After the first distillation half of the resulting low wines are then further distilled in an intermediate still and collected as ‘feints’. The feints are then mixes with the rest of the low wines and are distilled ‘as usual’ in the spirit still. Noone seems to be entirely sure why they do the intermediate distillation, but they’ve been doing it since the 1820s and don’t particularly want to change a formula that works. First up was Campbeltown Loch 21 years old, the yet-to-be-released latest edition of their 21yo blended whisky. Reception for previous releases in the range has been mixed, but the older bottlings have been rather well received. The man behind the blend is the Sprinbank production director Frank McHardy. He started in the industry in 1963 at Invergordon, moving to Springbank in 1979. He then disappeared ‘overseas’ in 1986 and took over as manager at Bushmills in Northern Ireland. All was well until 1996 when Frank’s successor left Springbank and Hedley Wright started looking around for a new manager – he contacted Frank to ask for a recommendation and Frank recommended himself. He returned, brought his knowledge from Bushmills (triple distilled Hazelburn was first produced in 1997…) and after a second innings of 17 years will be retiring in the summer of 2013. The new 21yo is about 40% grain whisky from Girvan and 60% malt whisky, not a lot of which is from Springbank thanks to a distinct lack of older stock in their warehouses. On the nose it had honey, lemon, hints of brine, sweet red fruit, freshly milled grain, anis and some Corn Flakes. To taste it was packed with sweet fruit, mainly apple and mango as well as some gummi sweets, and had a touch of cinnamon toast, with water amplifying the fruitiness. It finished with orange peel, tropical fruit and a tingle of cinnamon. Next on the mat was the 5th batch of Springbank 12yo Cask Strength, which was bottled a couple of days after the tasting. I’ve seen the previous batches at work and been hassled by enthusiastic customers whenever a new one is in the offing but have never had a chance to try them before. Each batch is about 9000 bottles and is a mix of 50/50 sherry and bourbon cask matured spirit. On the nose it had m’colleague Tim’s ‘wet dog’, a musty dampness that I normally think of as ‘wet car blanket’, brine, coal dust, sweet peat, star fruit and orange peel. To taste it kicked off with sweet apple and bitter coal dust, moving on through a stack of tropical fruit, fizzy fruit chews and some light smoke. Water brought out more sweetness, taming the coal, and also added a note of marzipan. It finished with soft apple, dried apricot and a lick of smoke. It appeared on my desk last week and will be coming home with me as soon as it goes on sale – excellent. Third was the one actually released whisky of the night – Springbank Calvados. They like playing with interesting casks and release one each year, with previous editions including Gaja Barolo (red wine – my first Longrow and the start of my interest in their whiskies), port and madeira, but this one is slightly more left-field, using calvados casks. 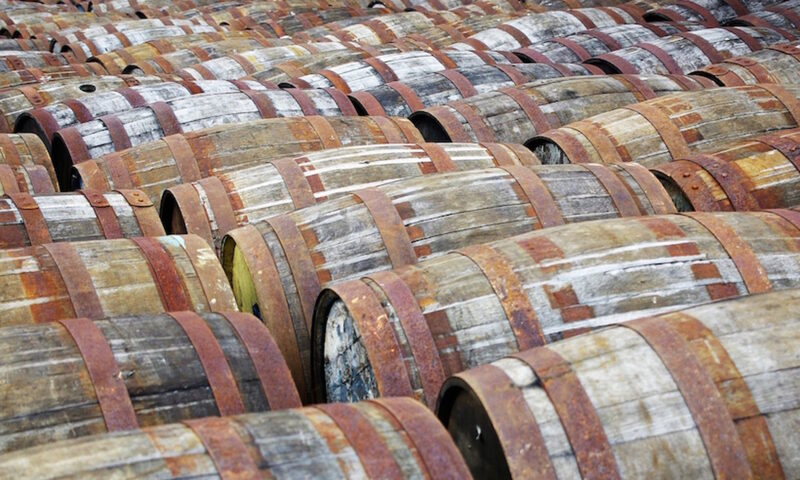 The whisky was matured for 6 years in bourbon casks and then transferred for a 6 year ‘finish’ in the Calvados casks before being bottled at cask strength and released in a batch of 9200 bottles. On the nose it had sweet peat and damp blankets (the combination of which is now ‘Springbank’ in my head), apple sweets (gummi and Chewitts) and elegant appley, calvados notes. To taste it was light and sweet, with intense sugar syrup, dried apple rings, white pepper and fruity chews. Water made everything a bit darker, bringing out chocolate, coffee, dried fruit and a touch of apple skin. It finished quite peppery with lots of apple – chews, dried flesh and sour skin. 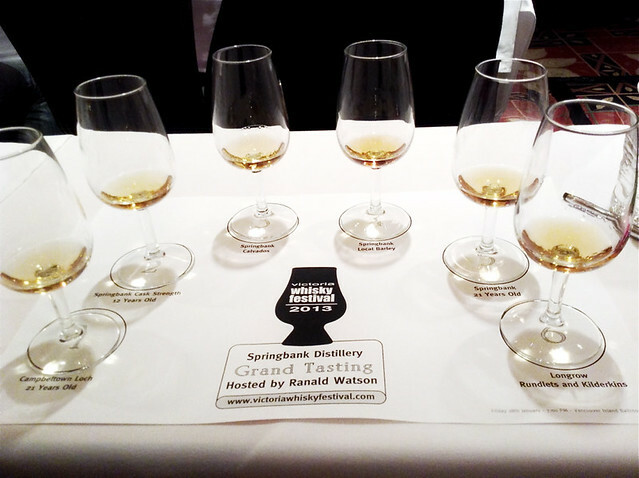 The next whisky was one that intrigued me from the name on the mat – Springbank Local Barley. The Local Barley whiskies are more well-known as a legendary range of drams distilled in the 1960s from Campbeltown grain. They are now regarded as some of the best Springbanks of all time and command prices that reflect that. 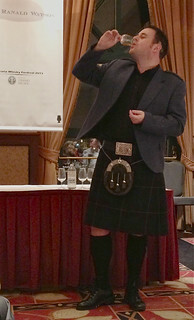 However, there have been rumours of more local barley experiments being done behind the scenes, helped along by the distillery’s tradition of giving very limited bottlings out to their staff as a Christmas bonus, many of which have turned up on the auction and private sale market and some of which have featured the Local Barley moniker. This one is from a 1999 distillation, currently still in the cask, part of the yearly program of producing at least one batch of local barley based whisky, distilled and matured separately to the regular stock. It used optic barley and our sample came from a fresh oloroso cask, with a rough strength of 56-57% ABV. On the nose it was quite dry, with twigs, brine, crushed black pepper, hints of sweet smoke, tangerines, creamed butter and sugar, and a touch of dark chocolate. To taste there was black liquorice, spicy grain, custard, sharp green apples and brown sugar, with water lightening and sweetening things, as well as adding more spice. It finished quite hot, with sharp apple that faded over time into lingering, perfumed, woody notes. Rather different, with more dark notes than the previous drams – if this gets bottled and is a reasonable price then it’ll be on my shopping list. On the nose it had, like the other Springbanks, lots of fruit, but even more so than the others – apple, star fruit, unripe mango, nectarine, grapefruit and apricot. Lots of the smoke has been rounded off in the cask, leaving a waxy, sandalwood perfumed note. To taste it was soft and fruity, bringing in the fruit from the nose along with a light white pepper spiciness, and water brought out a touch more sweetness as well as some butter. It finished with even more fruit and a bit of dark liquorice. I don’t know if it’s worth the RRP, but it’s certainly a great whisky – stacked full of fruit without becoming cloying. The last dram of the night was our only Longrow, the style of spirit that drew me in to be interested in the distillery in the first place. They originally started production of Longrow in 1973 to produce smoky whisky for their blends and stopped in 1975. A few years later they checked to see how the whisky was getting on and finding that it worked rather well as a single malt and bottled some. They restarted production of the style in 1992/1993 and have continued doing so since. The whisky in question was Longrow Rundlets & Kilderkins, the follow-up to last year’s Springbank edition and the pre-cursor to (we assume) next year’s Hazelburn version. It was distilled in 2001 and then matured in small 60-80 litre casks, aka Rundlets (1/14 of a tun, approx 68 litres) and Kilderkins (2 firkins, approx 80 litres). It has since been released, being bottled a couple of days after the tasting. On the nose it had smoky pine, dry red wine sourness and a touch of tar. To taste it had lots of sweetness with fruit, earthy peat, wood smoke and sugar syrup. Water tempered the smoke and opened things up a bit, revealing some more fruit on the nose and a touch of vanilla on the palate. It finished with light smoke and tar, black treacle and peppery spice. I was slightly disappointed by this, hoping that I’d like it as much as the Springbank R&K (which is currently sitting in my ‘special occasion’ stash’), but I felt it was rather simpler than the previous edition – it’s a tasty dram, but not quite what I was hoping for. All in all a great reminder of why I should be keeping an eye on Springbank. Now to hope that the Local Barley does appear soon and doesn’t have a price tag that rivals the 21yo.